The Nostalgia Coca-Cola RRF300SDBCOKE 3.2 cu. ft. Refrigerator with Freezer Compartment keeps foods and beverages chilled and on hand. A roomy inside features a freezer compartment and two slide-out glass shelves, along with 2 l bottle storage and a can dispenser built into the interior of the door. Operated by a simple dial control, the adjustable thermostat keeps foods at the ideal temperature. 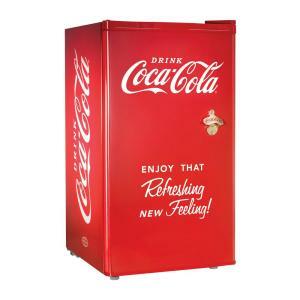 Outfitted with classic Coca-Cola design elements, such as a distinctive metal bottle opener, the exterior adds the perfect touch of Nostalgia and functionality to home offices, recreation rooms, dorm rooms, and more. Kitchen Goods, a unit of Dominant Systems Corporation, uses sophisticated crawler software to search the web looking for great product deals online. For this page, related items include products we find that match the following keywords: "Refrigerator" at our vendor partner Home Depot. Nostalgia Coca-Cola 3.2 cu. ft. Mini Refrigerator in Red is one of 267 Refrigerators and related products available for sale through Kitchengoods.com, If you have any questions on this product, please give us a call at 734-971-1210 during the hours of 9am - 5pm EST for assistance. Thank you for shopping at Kitchen Goods, your place for kitchen gadgets, and more!